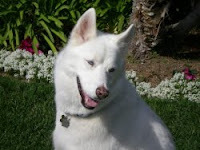 Head Tremors--Holistic Pet Care Helped! Pictured above is my boy Bleu, a 6 year old Siberian husky who is full of energy. Today is the 3 month anniversary of Bleu's last head tremor which is truly amazing and a testimonial to the power of holistic pet care!!! A canine head tremor is very frightening to witness, especially the first time. It is very common in certain breeds such as Doberman Pinschers and Bulldogs but can occur in any breed. Essentially, the dog has involuntary bobbing of his head and it shakes uncontrollably--very upsetting for the dog and owner. It is essential to use K9 Digestive Enzymes for your pet to make him or her feel better. K9 Digestive Enzymes are critical for the proper absorption of nutrients and for maintaining pet health. In June, during a busy time of year, Bleu walked over to me after a long day and his head was bobbing. At first, I thought he was just anxious or nervous. But as the head tremor continued, I quickly realized he had no control--his head would not stop bobbing. He looked just like one of those bobbing dog toys. What was also odd was that he was completely conscious, looking straight at me and yet it was as though his head had a mind of its own. It went away, to my relief after a few minutes and I thought it was just all the stress--after all, we just had a slab leak following a houseful of guests for my stepdaughter's graduation. Three weeks later, it happened again. This time, no stress in the household. Then, the intervals started getting shorter. I researched online, had lots of tests done--nothing. I found out that this involuntary head tremor might be somehow related to either abnormal calcium fluctuations or low blood sugar--both conditions that can give a dog or person "the shakes" or tremors. In my initial attempts to control the situation, we saw a slight improvement in that the tremors, which had been coming more frequently were stabilizing, but they were still coming. However, as time progressed and I stuck religiously to his supplement and diet regimen, the tremors stopped. We did not use medication (there is no medication for this) but consistently using calcium, parathyroid support, a hypoallergenic diet and K9 Digestive Enzymes. When one night I didn't give him his K9 Digestive Enzymes, he had a tremor the next morning. What this told me was that consistency was everything. This is the same with treating pets that have diabetes or epilepsy--timing and consistency in giving food and supplements is critical. It also shows that even when there is no hope, there are answers in holistic veterinary care that might not occur with conventional veterinary care. My understanding is that many pet owners who have pets with this condition have spent thousands of dollars on testing and just like in our case, the tests find nothing. What I can say in Bleu's case, is that the results speak for themselves. If anyone you know ever encounters this head tremors or head bobbing or even other neurological conditions such as epilepsy, please encourage them to schedule a telephone appointment with the nutritionist, Susan Davis. I will be happy to help. What is the brand name of the "Digestzymes" you use? A LOT of hits come up by pettung Digestzymes in the search bar and there must be a hundred different companies/formulas. All, what do you use for "parathyroid" support? My 20 month old male Dobermann is having small, sporadic head tremors recently. I can't stand his life being anything but absolute perfect happiness 24/7. He is my reason for living. K9 Digestive Enzymes is the brand http://www.askariel.com/product-p/14.htm that we used. I would not suggest using the parathyroid supplement without the advise of a holistic veterinarian. The formula is made by Standard Process but should not be given without doing the parathyroid test first.